The desire for knowledge, resources, and fame as well as a sense of duty and adventurousness has driven intrepid explorers away from their homes and into the unknown since the time of the first people. Human beings are naturally curious, and their ability to imagine what lies just beyond the horizon has helped them populate the globe, driven their technological advancements, and allowed them to discover new ways of surviving in even the most inhospitable of environments. Encyclopedia of Exploration is a two-volume reference to the history of human exploration over land, across and under seas, and into space. This must-have seta fascinating, comprehensive reference covering core topics in the school curriculum for world history and geographydetails various aspects of exploration, many of the great expeditions, and numerous explorers. Bridging the curiosity of today's students and general readers with the experiences of explorers of the past, the encyclopedia provides easy access to a wide range of important and interesting information. Volume I: The Explorers is a "who was who" of world explorers, while Volume II: Places, Technologies, and Cultural Trends covers other significant aspects of the history of exploration. The thematic organization of the volumes allows readers to access biographical profiles of important explorers in one volume, while referring to the second volume for entries on topics such as cartography, circumnavigation, navigation, shipbuilding, missionaries, the slave trade, the Vikings, women explorers, and the fur trade. This definitive reference to explorers and exploration features thorough coverage and a wide scope, making it an informative, fascinating resource suitable for students, researchers, and general readers. Volume I: The Explorers focuses on the explorers, giving readers a sense of the human dramathe achievements and the challengesthat those who go where few or none have gone before must face. Volume II: Places, Technologies, and Cultural Trends covers the technical, social, cultural, and geographical elements of world exploration. This volume's detailed, A-to-Z entries emphasize the many elements that have often determined the success or failure of a given mission. Cross-references across the two volumes help readers connect explorers with places and general themes. The set includes valuable reference material such as 211 black-and-white photographs, 62 maps, a chronology of exploration, a further reading list, subject indexes, and a general index. 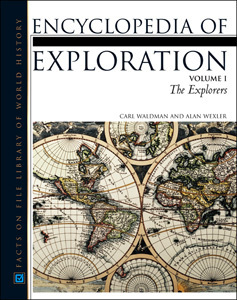 "College-level library collections seeking a comprehensive reference to exploration would do well to consider the Encyclopedia of Exploration..."
"...recommended for high school and undergraduate collections." "Few encyclopedias so successfully combine biographies of explorers with information about where they wentall provided at such a reasonable price. Recommended for public libraries..."
"...very thorough...This set is well organized and very readable. It will be used by students in high school and college, and by anyone who wishes to learn more about explorers and exploration. It is highly recommended for public, school, and undergraduate libraries." "While high school students engaged in in-depth research will appreciate this set, the extensive biographical coverage makes the first volume useful as a reference to slightly younger readers as well."